At any time, you can open multicam clips in the Angle Editor to adjust the synchronization and the angle order, set the monitoring angle, or add or delete angles. Note: When you open any multicam clip in the Angle Editor (whether from the Browser or the Timeline) you are actually opening the parent multicam clip. Any changes you make in the Angle Editor are propagated to all child clips of that multicam clip, in every project. For more information, see Create multicam clips in the Browser. You can use the Angle Editor to edit the individual clips inside a multicam clip (similar to how you can edit the contents of a compound clip). The many changes you can make in the Angle Editor include basic edits and trimming as well as effects you would normally add in the Timeline, such as color corrections and transitions. You can copy and paste clips in the Angle Editor. Clips are pasted sequentially as overwrite edits, and in the monitoring angle only. Tip: Before you edit multicam clips in the Angle Editor, duplicate them in the Browser to maintain clean backup copies. You cannot cut and switch between angles in the Angle Editor. You also cannot connect clips, solo clips, use the Precision Editor, perform ripple deletes, or use the Detach Audio and Break Apart Clip Items commands. Double-click a multicam clip in the Browser. 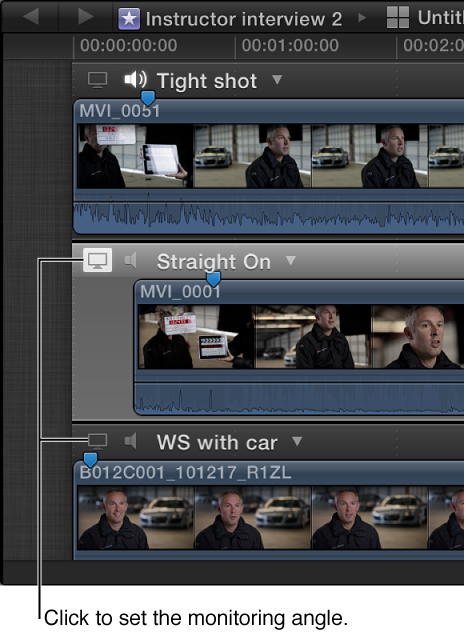 Control-click a multicam clip in the Browser or the Timeline, and choose Open in Angle Editor from the shortcut menu. 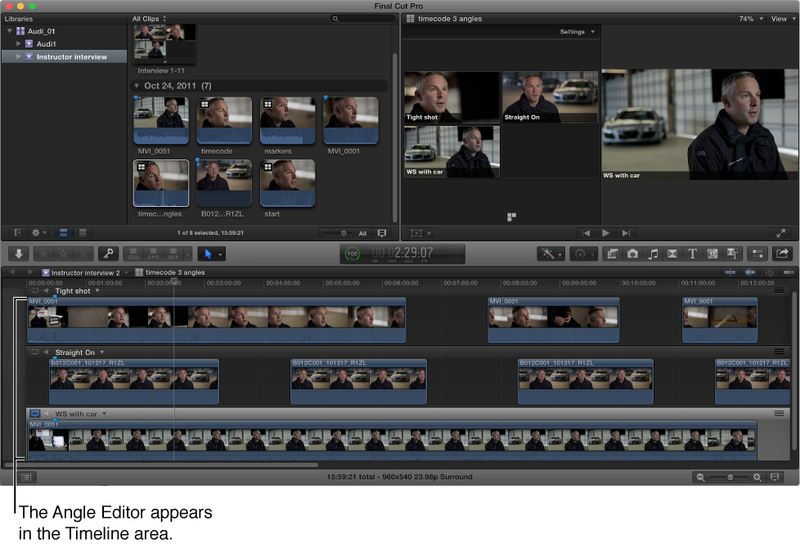 The Angle Editor opens in the Timeline area at the bottom of the Final Cut Pro window. Although similar to the Timeline, the Angle Editor provides a separate interface dedicated to editing angles and clips inside multicam clips. Each angle in the multicam clip appears as a separate row in the Angle Editor. In the Angle Editor, you can set any one angle to be the monitoring angle. This is the angle you see in the Viewer when the multicam clip is playing back in the Angle Editor. You can also monitor the audio of any number of angles at once. You use the monitoring angle to synchronize angles in the Angle Editor. The monitoring angle is not the same thing as the active angle (which you see in the Timeline). You cannot cut and switch between angles in the Angle Editor. Note: Setting the correct monitoring angle is important for the two synchronization commands described later in this section: Sync to Monitoring Angle and Sync Angle to Monitoring Angle. 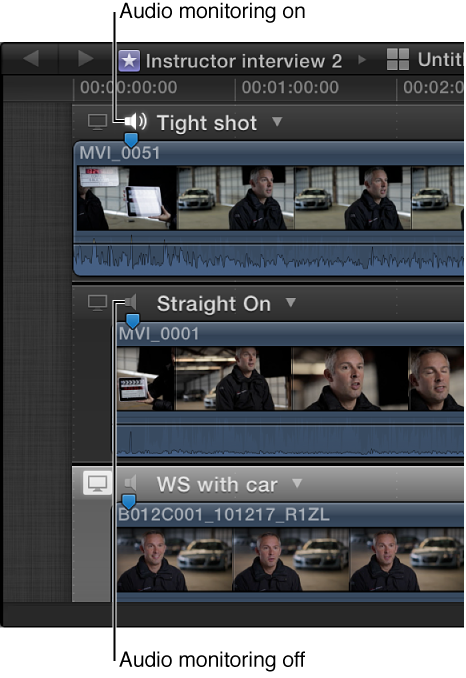 Control-click a multicam clip in the Browser or the Timeline and choose Open in Angle Editor from the shortcut menu. Click the Video Monitor icon at the left side of the angle. Choose Set Monitoring Angle from the pop-up menu next to the angle name. Press Shift-V while skimming the angle. The Video Monitor icon turns white, and the entire angle is highlighted in light gray. The angle plays in the Viewer when you play back the multicam clip in the Angle Editor. Only one angle can be the video monitoring angle at a time. The monitoring settings do not affect any of your active angles. They simply change what is playing back in the Viewer while you’re working in the Angle Editor. Tip: You can use audio monitoring to double-check the synchronization of individual angles in a multicam clip. 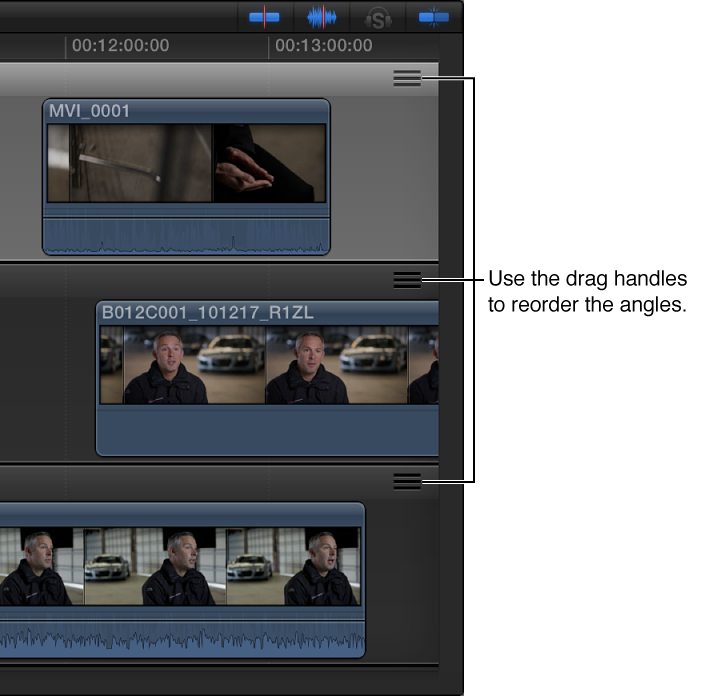 Open the clip in the Angle Editor, and turn on audio monitoring for two or more angles at a time. You will hear immediately if the angles are in sync or if you need to adjust them further. A primary function of the Angle Editor is to provide an easy way to correct out-of-sync angles in your multicam clips. The instructions below describe how to synchronize angles by locating sync points and then manually dragging them into alignment. Locate a sync point in one of the out-of-sync angles by skimming the angle in the Angle Editor. As you skim, the angle is displayed in the left side of the Viewer (in place of the Angle Viewer). The sync points could be video or audio cues (such as a clapboard closing or a door slam). Locate the corresponding sync point in one or more angles that you want to synchronize to the original angle. To simplify this process, you can add markers at the sync points, to guide you visually and to provide snap points. Drag the clips left or right in the rows of the Angle Editor so that the sync points align vertically. If an angle contains more than one clip, you can easily select all clips in the angle so that you can move them all at once. To do this, choose Select Clips in Angle from the pop-up menu next to the angle name. You can then drag the clips left or right to move them all by the same amount. 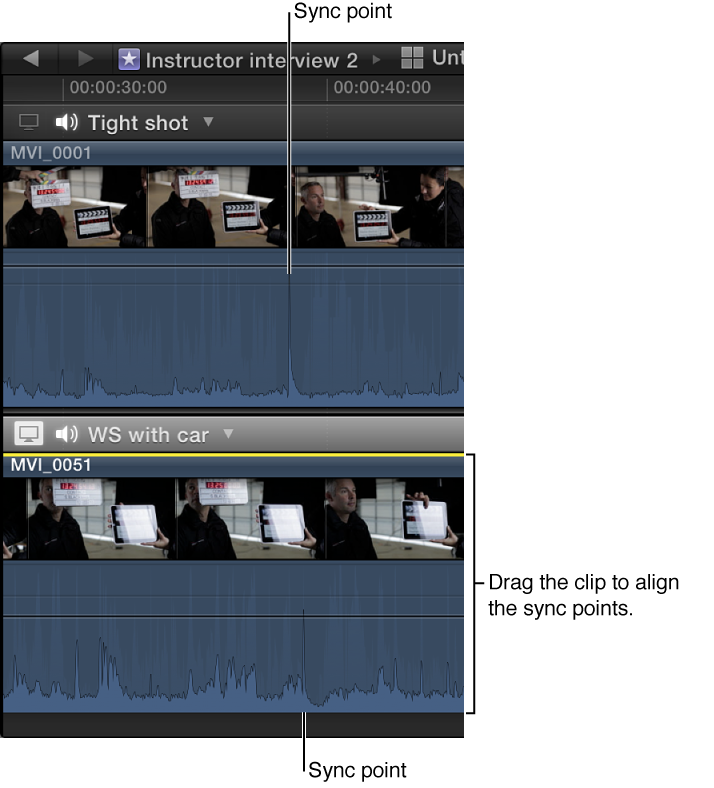 The instructions below describe two automatic methods for synchronizing angles in a multicam clip. Sync to Monitoring Angle: This option opens a two-up display in the Viewer, showing the frame at the skimmer position on the left and the frame at the playhead position of the monitoring angle on the right. In the out-of-sync angle, skim to a frame and click to sync the angle to the playhead position. All the clips in the angle move together to align the frame you clicked with the playhead. To close the two-up display in the Viewer, click Done. Sync Angle to Monitoring Angle: This option compares the audio waveforms in the selected angle to the waveforms in the monitoring angle, and then moves the clips in the selected angle to synchronize them with those in the monitoring angle. This is the same audio sync technology that you can use to automatically analyze and sync clips together into a compound clip. 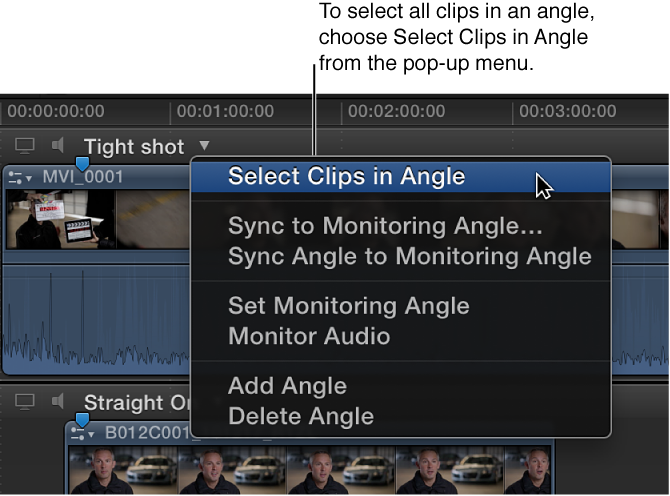 If you select clips in one or more angles before choosing this option, the command name in the pop-up menu changes to Sync Selection to Monitoring Angle. When you choose this option, Final Cut Pro moves all of the selected clips to synchronize them with those in the monitoring angle. If there is a selection in the monitoring angle, this option is not available. WARNING: This option does not ripple clips forward. If clips are moved to a Timeline location that is already occupied by existing clips, the moved clips overwrite the existing clips. Note: Some audio recordings are not suited for use with this feature. Choosing this option may result in long processing times during which Final Cut Pro is not available for editing. You can adjust the order in which angles appear in the Angle Viewer and the Angle Editor. Note: If you’ve already started a multicam edit on a multicam clip in the Timeline, changing the angle order does not affect which angle is chosen for each cut and switch edit. At the right side of the Angle Editor, use the drag handles to drag the angle rows up or down to reorder them. The angles in the Angle Editor and the Angle Viewer change to the new order. To delete an angle: Choose Delete Angle from the pop-up menu to the right of the angle name. The angle is removed from the Angle Editor, the Angle Viewer, and all child clips of the multicam clip. Important: Deleting an active angle affects the edits in your projects. The deleted angle is replaced with black filler in all projects. To add an angle: Choose Add Angle from the pop-up menu to the right of the angle name. A new, empty angle appears in the Angle Editor and the Angle Viewer. To rename an angle: At the left side of the Angle Editor, click the name of the angle you want to rename. When the text becomes highlighted, type the new name. The new name appears in the Angle Editor and (if overlays are turned on) in the Angle Viewer.